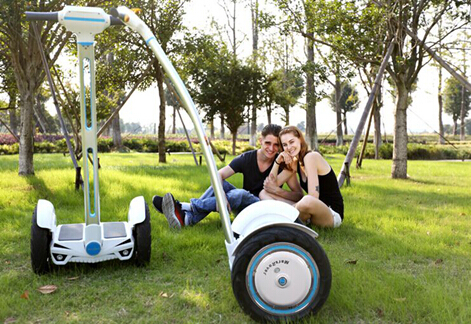 With the popularity of Electric balancing scooter all over the world. 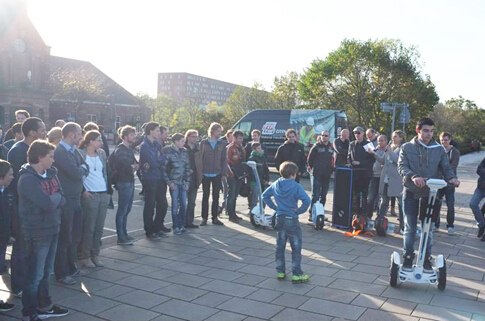 People realized the feasibility of Electric scooter as daily transport, no longer look it as esoteric transportation tool. Airwheel new arrived Electric scooter S3 has a good appearance attracting people’s love in it at first sight, on the hardware also perfectly meet the highest international standard, the two battery panel design makes the running safer, in which ensure the safety of user, and also ensure the battery life several times longer than conventional. In the world market of sever lack of resource with everything are considering of environment friendly by carbon reduction, the design of S3 are absolutely reasonable, both in the material to be used in accordance with the concept of environment protection, and saving cost in a certain level, which made the self-balancing scooter become more amiable. Whatever the formal occasion, patrol or regular working condition, self-balancing Electric scooter are always popular, the difference between motor vehicle is S3 powered by charge and absolutely energy saving and environment friendly, the unique of S3 is one key shut down which maximum saving the power, even in the idle condition will not lost the power, another convenience is lightweight and tiny, can be parked anywhere, unlike cars must be parked in designated space, so , if you are a the regular car driving person, are be suggested by try S3,you may love the more free experience of driving.